Dimensions (HxWxD): 2.2" x 2.2" x 0.3"
New Batch Just in! Prettier than ever!! These amazing, iridescent, gemstone quality Shimmering Tiger's Eye Power Beads display bands of fibrous, iridescent material ranging in color from root-beer brown to a range of ochers, umbers and even vermilion and gold, and contains quartz silica, chrysotile and Serpentine. Each bead on the strand is .3 inch in diameter and the entire bracelet weighs .6 ounce. 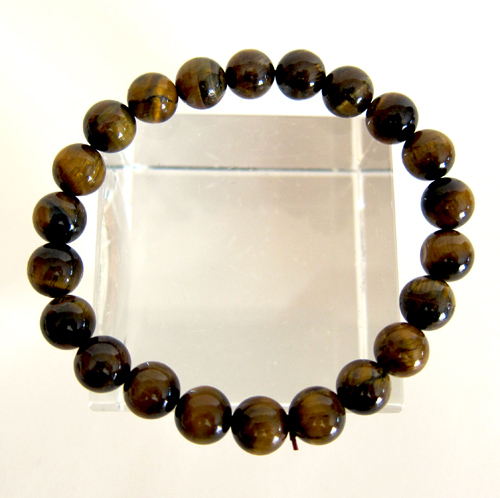 These Tiger's Eye Power Beads come from mineral deposits that are approximately one billion years old, and come from China. Tiger's Eye specimens exhibit a characteristic brilliant watery reflection on its surface as light changes or one's point of view shifts. This is known to gemologists as "chatoyancy". Coined from the French "chat oeil," meaning "cat's eye," chatoyancy occurs when light strikes fibrous material inside the stone, as in tiger eye quartz, or when light reflects from bands of fibrous inclusions or cavities within the stone, as in cat's eye chrysoberyl. "The effect can be likened to the sheen off a spool of silk; the mobile, wavering reflection always being perpendicular to the direction of the fibres," according to the Wikipedia. Tiger's Eye, or Magnesium Iron Silicate Hydroxide, forms when silica quartz invades a serpentine or chrysotile formation, in a mineral deposit, over long periods of time, forming bands of long fibrous inclusions which create the characteristic shiny, highly reflective, striated surface that makes this gemstone a favorite of jewelers and mineral collectors. Serpentine has been used by Lightworkers and crystal healers and meditators to facilitate the awakening of Kundalini energy, and to connect the heart chakra, associated with the color green, and the crown chakra, associated with the color gold. Meditators can use Tiger's Eye Egg to help direct Universal Life Force energies to their heart and especially to their crown chakra, where the gemstone will facilitate the rising of the energy from the base of the spine to the top of the head. We find that Arizona Tiger's Eye assists us in grounding spiritual energy & manifesting it in the world in our daily lives. These gemstone Power Beads have been cleaned with Universal Life Force Energy, and given an energy attunement using Reiki, a Japanese technique of energy healing, so it will continue to receive and transmit Universal Life Force Energy direct from the Source of Creation. It has also cleaned and charged with the natural energy of sunlight. It is ready for you to program according to your own needs and desires. Weight above is shipping weight. Average Net weight is .6 oz.